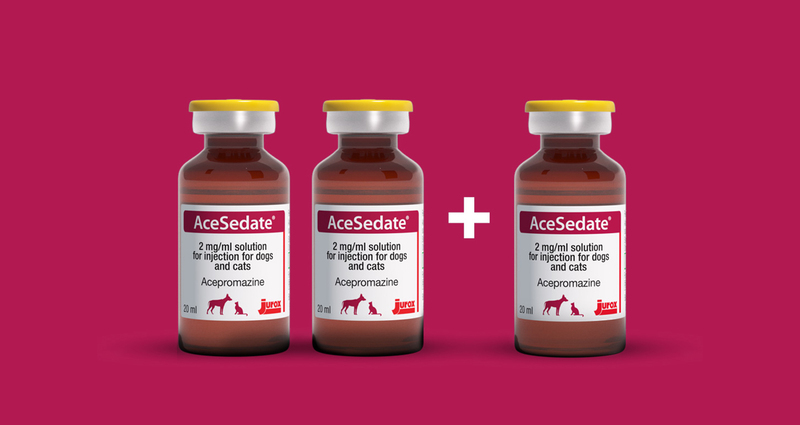 AceSedate contains acepromazine 2mg/ml and can be used for the premedication, sedation and tranquilisation of dogs and cats. For every two vials of AceSedate you receive one extra vial. Net price / vial after discount = £59.99. Offer ends 29th March 2019. Please note that orders will be placed on your behalf by Jurox. And delivery will be made via your preferred wholesaler. Position in Practice Please select your position Vet Partner Veterinarian Qualified Vet Nurse Head Nurse Vet Nurse Student Other This is required. Practice Postcode This is required. Vials of Acesedate Select number of vials 2 Vials + 1 Free Vial 4 Vials + 2 Free Vials 6 Vials + 3 Free Vials 8 Vials + 4 Free Vials 10 Vials + 5 Free Vials 12 Vials + 6 Free Vials This is required. All orders are final and will be placed with your wholesaler on your behalf. AceSedate® contains Acepromazine 2mg/ml. Legal category POM-V CD Sch 3. AceSedate® are trademarks of Jurox Pty Limited, Rutherford, NSW 2320, Australia. Further information is available on request from Jurox (UK) Private Limited Company, Richmond House, Second Floor, 105 High Street, Crawley, West Sussex, RH10 1DD. Tel 01293 510681.